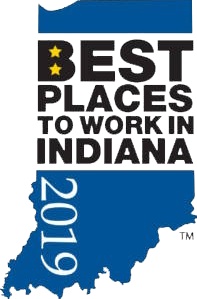 best places to work in Indiana! At Starin, we don’t just sell technology products; we share our passion for making the job of the communication professional easier and more profitable. Our unique culture fosters employee engagement, inspiration and innovation in a setting that encourages collaboration and teamwork. Here at Starin, we know our people are our greatest asset, and happy employees are successful employees. We schedule regular social events like potlucks and outings to promote a fun friendly atmosphere. Our headquarters was recently remodeled with state-of-the-art conference rooms and sit-to-stand desks to ensure employees are comfortable on the job. We have a culture of learning and empowerment. Revealing factors of Starin culture are long-term employees with low turnover, clear mission and values and transparency with regular communication from managers with input from the staff. Starin was founded in 1988 by Jim Starin. After his retirement, 100% of the company become part of an Employee Stock Ownership Plan (ESOP). Starin associates are financial participants in the success of Starin and to help grow our company both in profitability and in efficiency of operations and customer service. Now check-out some cool stuff about where we're from! Indiana Dunes National Park is a treasure of diverse natural resources located within an urban setting. Indiana Dunes National Park features communities that have both scientific and historic significance to the field of ecology. The park is comprised of over 15,000 acres of dunes, oak savannas, swamps, bogs, marshes, prairies, rivers, and forests. It contains 15 miles of Lake Michigan shoreline spanning the distance from Gary to Michigan City. The biological diversity within Indiana Dunes National Park is amongst the highest per unit area of all our national parks. A wide variety of habitats coupled with the moderating effects of Lake Michigan make the region an ideal home for hundreds of animal species including more than 350 species of birds which have been observed here. Over 1,100 flowering plant species and ferns make their homes here. From predacious bog plants to native prairie grasses and from towering white pines to rare algal species, the plant diversity is rich. From fishing off the south shore of Lake Michigan, to wind surfing on the waters of Wolf Lake, visitors flock from all over America to boat and fish in Northwest Indiana. Lake Michigan fishing is a perennial favorite, as many visitors take fishing charters onto the water in the hopes of catching chinook salmon, lake trout, steelhead trout and more. Wolf Lake and Lemon Lake are also popular fishing spots, where anglers can fish for bass, pike and catfish. Lake Michigan and Wolf Lake are both popular among boaters and sailors, with canoes and sailboats being welcome on both lakes. Wolf Lake is well-known for windsurfing and great for rowing. The South Shore area of Lake Michigan offers a number of harbors for boat entry: Hammond Marina, East Chicago Marina and a number of marinas in Michigan City and Portage. Beer geeks welcome! IPAs, stouts, wheat ales and more are available at any of the South Shore’s many microbreweries and pubs. In addition to the delicious craft beers, many of the microbreweries offer a selection of unique food pairings to enjoy while sampling the brews. To experience more of the South Shore’s breweries, explore the South Shore Brewery Trail! Where we're from, we've got quick access to Chicago. The Windy City is a cornucopia of modern art, fine dining, cutting edge comedy, and die-hard sports fans. Snap a photo of your reflection in the silver Cloud Gate sculpture at Millennium Park before heading to Grant Park to get hit with the refreshing spray of Buckingham Fountain. There are dozens of museums and theater companies in Chicago, so a cultural experience is never hard to find. You’re sure to laugh your head off at the Second City Theater, the professional launch pad of many famous comedians. Go ahead, get started...apply today!